Have you ever wanted to go to a Mardi Gras Ball? 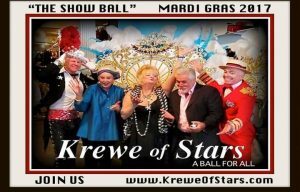 Be a part of History in the making as this unique troupe of artists and art lovers come together to celebrate the STAR in ALL OF US at the Krewe of Stars Ball! The all inclusive Krewe of Stars sets out to spotlight and honor the many talents that make our unique City of New Orleans one of the most interesting places to visit on the planet. What better way to celebrate the arts, than in our most notable party style, MARDI GRAS. Keep your calendars open on February 18, 2017, from 7-11PM at the Jefferson Performing Arts Center. The ball will offer a buffet style cocktail event ( catered by Messina’s Catering ) prior to the “Show Ball” beginning, held in the Beautiful atrium of the Jefferson Performing Arts Center. At curtain time Guests will notified to take their seats for the ball masque, which will be immediately followed up by a red carpet after party with music and cash bar fit for a star. The Krewe chose two of New Orleans celebrity greats to reign as the first royal couple. As well as a New Orleans treasure to reign as the Grand Duchess in perpetuity.